Can this really have happened 17 years ago today? My first thought: oh my, how fast time goes by! Can it really be that long ago? My second thought: Am I really that old to have been married for 17 years? 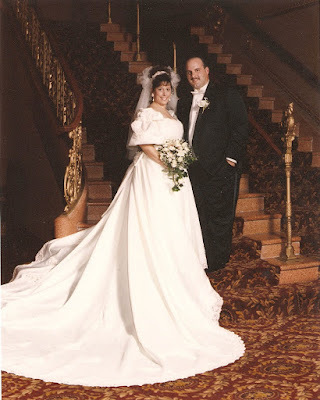 Happy 17th Anniversary Gina. Hope you have a wonderful celebration. Oh my goodness, you are a BEAUTIFUL bride!! Happy Anniversary you two!! Congratulations on your Anniversary!!! What a beautiful wedding picture. Sending you all my best wishes and may your marriage continue to be blessed always! Cheers!!! aw, Happy 17th! Wow... thats a long time, Congrats! !